Something that I try to do with my kids every year for Xmas is get a snap with the jolly ol' man. 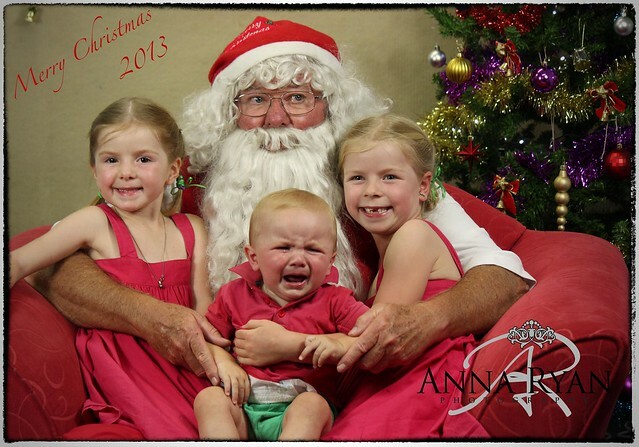 As any one with kids would know, it can be pretty hard to get a good family Xmas photo - poor lighting, bad location, feral kids, freaked-out kids, average looking Santa, the list could go on.... But, this year our photo was simply perfect! The Cobar Library had a great display set up - cosy lounge, beautifully decorated tree, awesome Santa (this one I've actually know since I was a little girl - Mr Brown you are AWESOME!!! ), great elf-helpers, air-conditioning, and what a bonus an actual PHOTOGRAPHER!!! Do you have any Xmas Photo memories (or tips)? If your anything like me, you will treasure the last photo :-))))) Great to share when the kids are adults. Oh those are precious photos! And your little guy is pretty typical at that age. Once he figures out Santa brings presents he'll be all over the guy! LOL! The girls are so pretty and photogenic. Glad you all had a good time. Lovely photo of the kidlets, one to treasure.....Anna is a talented young lady and I am pleased to see that she is pursuing her career in photography..
Classic Jodie!! I used to think the Santa photo was a bit daggy but now I wish I had started the tradition of having taken one each year. Tom is now at the stage where he is doubting Santa's authenticity!! But will try to take a nice family photo this year at Christmas and start that tradition. PS - any hints on decorating a child proof house for Christmas?? I have just put up the Christmas tree this afternoon and only put on 5 of my knitted stars and Alex has removed everyone one of them!! LOL!!! ~ no hints for toddler proof decorating... The way I see it is they're only this big once. Before we know it they'll be all grown up and not bothered with it all so I like to make the most of it while it lasts... I do put my tree up on an old dinning table that has the legs sawn down to about 60cm - Tobie can just reach the bottom row of decorations. As for everything else, he can reach most of that and it's a constant game of cleaning up after him (and my girls too mind you), but I'm cool with that.. They are beautiful photos Jodie. What treasures! I love the Carols at Cobar Jules - usually a dress up affair which adds to the excitement... I often miss it though - not on purpose, just loose track of time with the festive rush.. Must remember to go this year with the family..
One year olds really do not like Santa, do they? 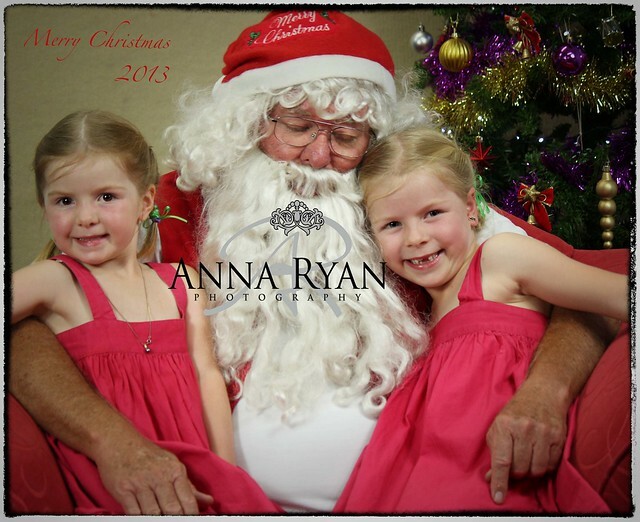 I have pics of my girls both clinging to me at that age, not wanting to sit on Santa's lap. Glad you had a merry old time! Oh little Tobie, he does not look impressed. LOL!!! Me too Susanne... My husband thinks I've scared him for life, not when her realises Santa is the one who brings all the goodies at the end of the year..
Love, love, love this photo! I have a photo almost just like this from when my kids were small. Seeing yours brought back memories of them taking a photo with santa every year.